Ariel Gorsky is the Associate Director of Institutional Advancement and Acting Director of Communications at Hadar. She earned a BA in Comparative Literature from Queens College and holds a dual graduate degree from New York University in Public Administration and Hebrew & Judaic Studies. 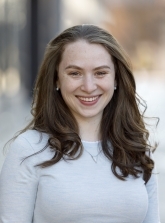 While studying at Queens College, Ariel served as Hillel Student Club President and the Financial Resource Development Intern at UJA-Federation of New York. She is a member of the Phi Beta Kappa Society, a Wexner Graduate Fellow and Davidson Scholar and a UJA Graduate Fellow. She has worked and volunteered for a number of Jewish organizations throughout her career.